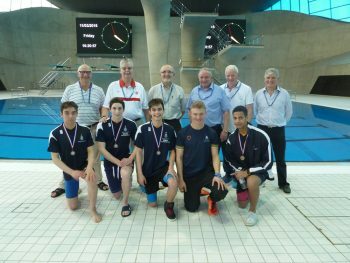 This inter-school swimming competition consisting of a freestyle relay race for 4 members, each swimming 100 metres, was first won by Whitgift in 1924 and 1925 and then again in 1966 and 1967. To celebrate the 50th anniversary of the 1966 win, the Captain, John Nalson (OW 1958-66) assembled the members of that winning squad as seen in the photo with William Clark, the 1967 Captain, coming over especially, from the USA. The School won again, in 2013 and 2014 with the competition record and this year the boys came home in a creditable 4th place.